ATHENS, Ohio – Momentum played a key in Saturday’s SIUE match at Ohio. Ohio improved to 6-5 overall and 4-2 in the Mid-American Conference by winning the first four matches as well as the final two against the Cougars, which dropped to 1-11 overall and 1-5 in the MAC. SIUE collected four straight wins at one point, including a second-period fall for Christian Dulaney at 197 pounds over Ohio’s Aaron Naples. 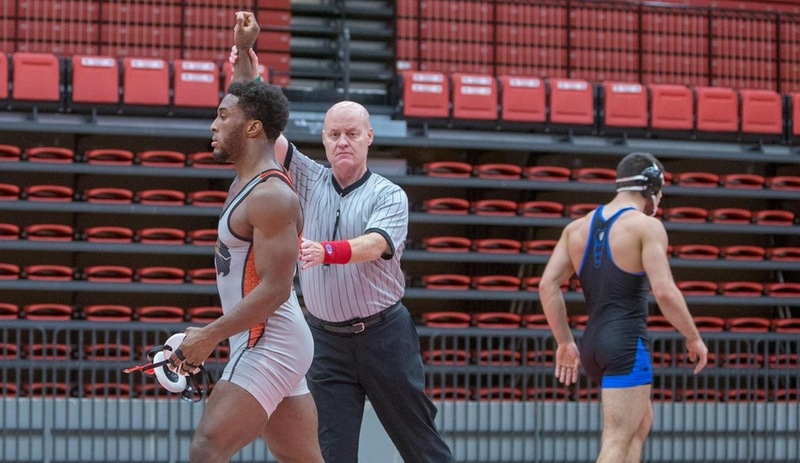 “Kevin Gschwendtner got a good win at 174,” said SIUE Head Coach Jeremy Spates. After starting at 141 pounds for the meet, Gschwendtner broke a streak of four straight wins for the Bobcats heading into a halftime break. Gschwendtner, Sergio Villalobos and Colton McKiernan all won matches by one or two points. Spates said some of SIUE’s losses were simply technical mistakes. The team wrestled hard, he noted, especially at the upper weights. SIUE now gets set for its final home dual match of the season. The Cougars will celebrate Senior Day with a 1 p.m. match next Sunday against Truman State.